In fact, it was around 41 degrees and raining. Most other school systems were already out for Presidents' Day and last year's SnowJam2015 made school and government officials increasingly sensitive in regards to weather, so they declared schools closed far in advance. Saturday night, actually! They probably should have waited as our winter forecasts can change dramatically in a matter of hours, but regardless, we were home yesterday and made an extra-special 'no-snow' snow day out of it. I don't complain about my child being home; I love to spend time with her! So I push aside my nagging work tasks (it's a snow day, after all!) and try to make it a fun day for all. 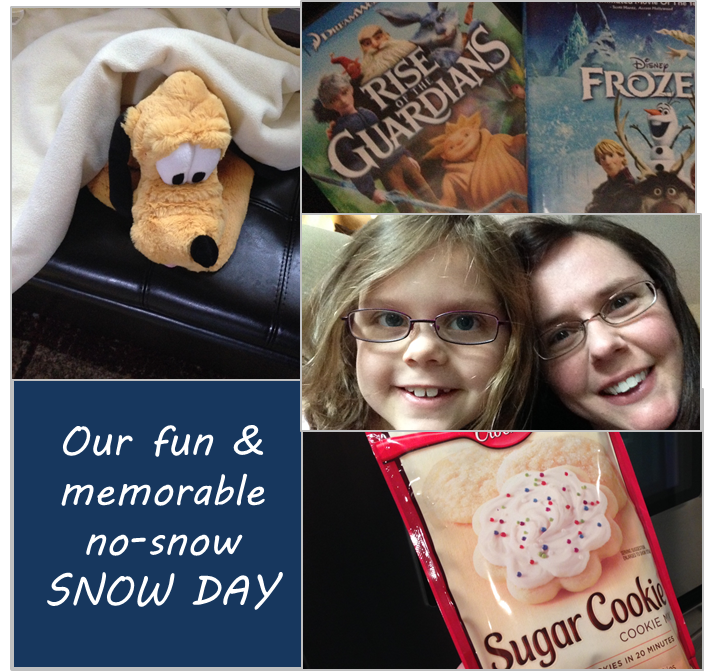 Do you want to know our formula for creating a really fun and memorable no-snow snow day? Oh, and comfortable clothes/PJs as well. The no-snow snow day is all about comfort and lounging at home. Even if roads are fine, it is probably too yucky or cold to go out, so we stay cozy. I enjoyed my soft fleece leggings and over-sized fleece tunic from Target. Best work-at-home-mom clothing, ever. Andrew was happy in his footie PJs. We select movies featuring snow, of course! If we cannot get any fluffy white stuff outside our door, we can live vicariously through films. Two favorites are Frozen (although Amelia, believe it or not, is not a huge fan) and Rise of the Guardians. Clearly, Jack Frost missed us yesterday; although I hear he made his presence quite known in middle Tennessee. My daughter loves to bake with me, so I always have some easy cookie and brownie mixes available in the pantry. On a surprise no-snow snow day, we can pull one out and have a tasty dessert within half an hour. Mmmm. I love to make no-snow snow days really special for the kids, so we allow ourselves to put aside most of the usual weekday to-dos and simply hang out. I actually woke up early (before the kids!) to complete some work deadlines specifically so I could be lazy with them for most of the day. They will only want to hang out with me for so long and the time is passing way too quickly. Amelia did not want to go back to school - and she didn't have to! The wet roads iced over and we have another no-snow snow day today! This time, Daddy is home for a few hours also. I made a family breakfast and we are all in PJs. We had a really special and wonderful day together yesterday, and hopefully we can continue the snuggles and smiles today. Do you complain about snow days? Or kinda love them?